This New Build Modern Villa is located in het heart of the Golden Mile in Marbella. The project consists of 15 homes distributed into 5 buildings on a 8.000 m2 plot of prime land. 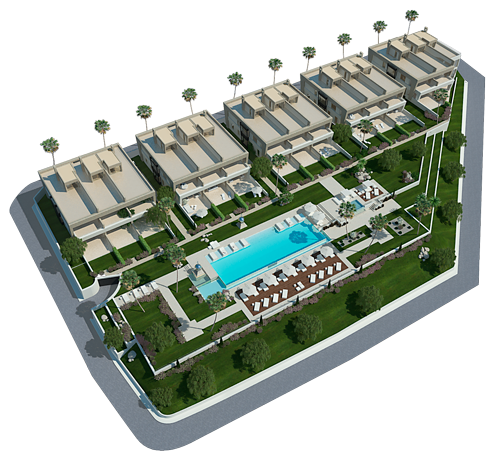 All blocks hold 3 fully independent villas, each having a private garden overlooking the intricate garden landscape. The 6.000 m2 communal area features a large pool, sun deck and landscaped gardens, making for idyllic surroundings in the most pleasant of environments. This project symbolizes the utmost quality standard in fusion with functional and creative high-end luxury residential living. The project is located in the very heart of the well known Marbella Golden Mile with very close proximity to Puerto Banús, Marbella town center, top beaches, leading restaurants and hotels, golf courses and other hot spots. On Istán Road, just one kilometer from the main coastal road A-7, it benefits from a simple and direct road and highway access so nearly every destination can be reached easily. Floor plans are conceived with an emphasis on spacious open areas, maximum floor to ceiling height level, as well as a premium on large face windows making for plentiful natural light throughout. Basements will have from 128 to 188 m2 allowing to comfortably have up to 5 bedrooms in total as well as the possibility of adding a home cinema, gym, entertainment or second kitchen.